Pendant and chain, Anti-Vietnam War, metal, maker unknown, Australia, 1965-1975. 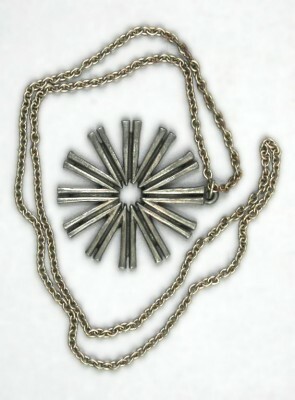 A metal chain with an attached pendant in the shape of the Vietnam Moratorium logo of a twelve spoked star around a central hole.Dimensions: 445mm long x 60 diameter. National service’s early opponents included the Parliamentary Opposition, religious groups, trade unionists, academics, and young men affected by the scheme. From within this disparate anti-conscription movement groups began to form and organise, some becoming prominent and forming branches across Australia. 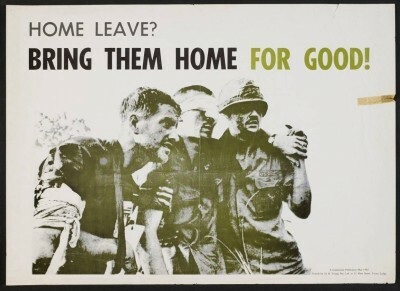 Among them: Youth Campaign Against Conscription (YCAC) formed in late 1964 and closely aligned to the Australian Labor Party (ALP) and Save Our Sons (SOS) founded in Sydney in 1965 shortly after the government announced an increase of troops to Vietnam. The announcement gave the protest movement some momentum, but it built slowly as anti-war groups began working together and learning lessons from similar groups in the United States. 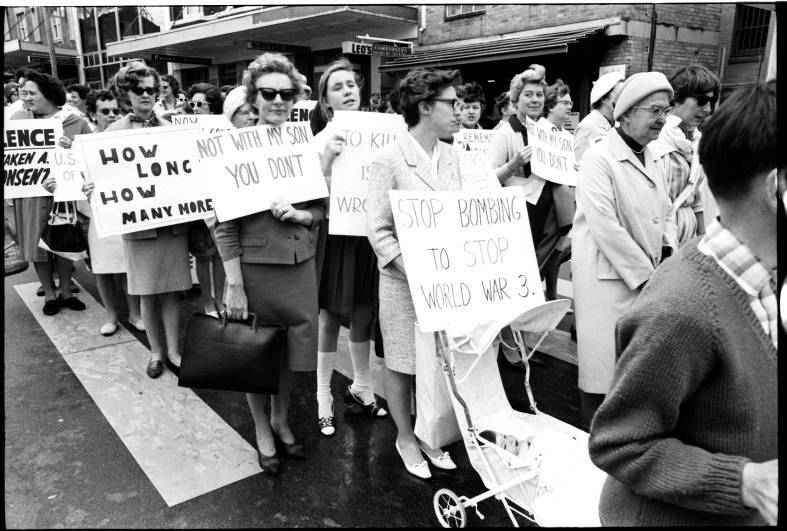 By 1969 those who opposed the war had increased in number and become sufficiently well organised to coordinate Australia-wide mass protests, known as the moratorium marches of 1970–71. Involvement in anti-war activities politicised many previously disinterested Australians. Opposition to the war was a radicalising experience for some people such as the middle-class women, members of ‘Save Our Sons’, who were arrested during peaceful protests outside national service induction centres. The anti Vietnam War movement also voiced concerns over the safety and welfare of the Vietnamese people on both sides of the conflict. People were concerned with the toll heavy bombing that the United States was undertaking on innocent farmers who were considered collateral damage in the war against the Vietcong. Others were concerned of the fate of average Vietnamese people not involved in the fighting when the North Vietnamese forces took over the country. The anti Vietnam War Movement laid the foundation for the wide spread acceptance of Vietnamese refugees who began arriving on Australia’s northern coast from 1978. 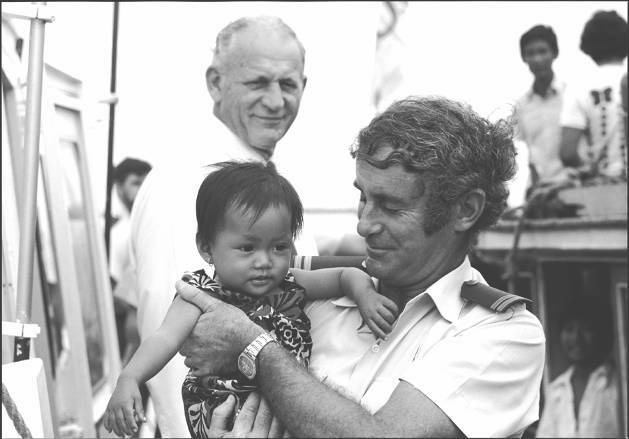 When the first boats started arriving suddenly Australian’s were made aware of the refugee’s plight enduring the dangerous boats journey to Australia or detained in refugee camps in south east Asia. In 1979 most Vietnamese refugees were selected by immigration officers in camps in Thailand, Indonesia and Malaysia. Those with useful skills and a working knowledge of English were selected. By 1982 the Vietnamese government agreed to allow refugees to leave Vietnam freely. Many refugees came to Australia to be reunited with family who had arrived as boat people or from refugee camps. The Anti Vietnam war pendant has historic significance as evidence of the conflict in Australian society over Australia’s involvement in the Vietnam War, the conscripting of Australian young men to fight there and the effects of the war on the Vietnamese people. The anti Vietnam War Movement corralled many disparate groups in Australian Society who coalesced into a movement who questioned wider issues such as the environment, Aboriginal rights, feminism, legal reforms and the right of refugees. The Anti Vietnam war pendant has aesthetic significance in the design of political symbols, marketing of ideals and the production of objects with political meanings and iconography. The Anti Vietnam war pendant has intangible significance to the generation in Australian society who took part on both sides of the often bitter debate and protests in the late 1960s and early 1970s. The Anti Vietnam war pendant represents a time when Australia was undergoing a metamorphosis from a post colonial society of the early 20th Century into modern Australia of today. Australia was experiencing waves of post war migration from Europe and other non British countries and Australia’s continuation and conscription of her young men in what was widely seen as a colonial war conducted by a corrupt regime in America and Canberra was an anathema to large groups of the Australian community who could still remember the results and hardships of World War Two and the Korean War. The Anti Vietnam war pendant provides an interpretation tool to communicate the issues surrounding the Vietnam War. The colonial polices of France and the USA and Australia’s role and attitudes to south east Asia. It is quite a poignant bookend to the nation’s attitude to Chinese gold miners on the goldfields in the 19th century and the episode changed how Australia saw itself in the regional afterwards.